Pajanimals Celebrate Dad with Giveaway! Lots of Pajanimals news for the month of June! Have you seen an episode yet? Their television series airs nightly at 8 p.m. 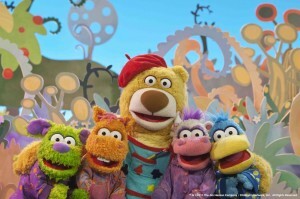 ET on 24-hour preschool television channel Sprout® during The Good Night Show programming block and also airs on NBC every Saturday morning as part of the NBC Kids programming block. Go to the Sprout website to help your little ones Send Dad a Father’s Day Message. Then, on Saturday, June 15, and Sunday, June 16, join Chica and Mr. C from 9 a.m. to noon EST for a special Father’s Day celebration featuring messages from Sproutlets. After watching Sprout in the morning, you can also watch how Squacky deals with Blankie in the Laundry, the Pajanimals episode for Saturday, June 15, airing at 8 p.m. EST. After Squacky spills glue and glitter on his blankie just before bedtime, he can’t sleep because his blankie is being washed! The Pajanimals travel to the Land of Hush where Bedtime Bunny helps Squacky to realize that all he wants at bedtime is something that reminds him of Mom and Dad, so Squacky goes to bed snuggling his dinosaur Pete. On Sunday, June 16, the Pajanimals’ episode airing at 8 p.m. EST deals with Missing Mom and Dad. At bedtime, Sweet Pea Sue misses Mom and Dad and wishes she could sneak into their bed where it feels so “warm and safe.” The Pajanimals travel to The Night Sky where The Moon comforts Sweet Pea Sue and tells her that her parents are very close by and will always be there if she needs them. The Jim Henson Company is also offering a FREE, downloadable, printable Pajanimal’s themed Father’s Day Card! Pajanimals has teamed up with BirthdayExpress.com for themed party needs. Here are a bunch of ideas to make your month fun! Design a fun backyard scavenger hunt by placing the colorful party favors like the Pajanimals temporary tattoos, hats, noise-makers and stickers in secret locations throughout your backyard. Create an obstacle course using items already in your yard – army-crawl under the patio table, run through loops created with the garden hose, do a lap around the flower beds. Let the kids decorate their own pre-baked cupcake for Dad and give a Pajanimals party t-shirt to the winning decorator. Toddlers and preschoolers can try daytime camping by taking their nap outside. Put a pop-up tent in the backyard along with sleeping bags or mats and blankets and pillows. The kids can crawl into the tent for a little rest in the great outdoors. Visit the Sprout website and download instructions for making Apollo’s Moon & Stars snacks to enjoy in the great outdoors. So easy, and the kids will love ‘em! Host an outdoor sleepover for kids and their dads, including setting up tents and sleeping bags in the backyard. 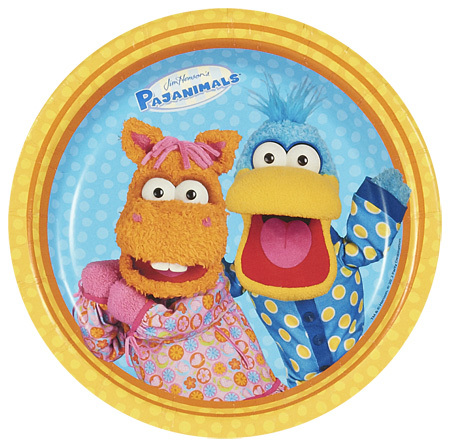 After dark, hide prizes, like the Pajanimals favor box filled with the makings of s’mores, somewhere in your backyard. Give kids flashlights to find the prizes. You can also hide one prize at a time and make it a competition by timing how long it takes each kid to find their favor box prize. Help them along by saying “getting lighter” when they near the loot, and “getting darker” when they move away from the prize location. Combine both these ideas and have an Outdoor Father’s Day BBQ. Sounds fun! 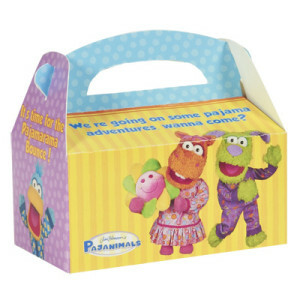 WIN Pajanimals Themed Disposable Party Goods from BirthdayExpress.com! I received this items for review free of charge and all opinions are my own. This giveaway will end on June 17, 2013 at midnight EST. Winners will be drawn via rafflecopter. Once a winner is drawn I will contact them and they will have 48 hours to reply before I draw a new winner. Giveaway is open to anyone in US and Canada and you must be 18 years of age or older. Giveaway not affiliated with Facebook & I release them of liability. Winner will be posted in the rafflecopter widget. This show already has me laughing just from reading the description. Read on about this new game starting on ABC. Airing on Saturdays at 8/7 Central. View the cutest clips of the stars of the show! Visit the Game Gallery to watch the babies and parents in action, playing awesome games together such as Toy Time, Stack ‘Em, and The Sound of Moo-sic. Are you ready to watch? This giveaway will end on June 6, 2013 at midnight EST. Winners will be drawn via rafflecopter. Once a winner is drawn I will contact them and they will have 48 hours to reply before I draw a new winner. Giveaway is open to anyone in US and you must be 18 years of age or older. Giveaway not affiliated with Facebook & I release them of liability. Winner will be posted in the rafflecopter widget.